The humble bathroom, usually the smallest room in the house and often the least decorated. With some of these tips and ideas, you can make your tiny bathroom look like a mini spa, a place you will be proud to show your guests. No matter how small a bathroom is, it can still be made into a work of art. This article will be ideal for people that have a small bathroom and want to not only make the most of the limited space available but also want to upgrade its look. By using some of these tips and decorating ideas for small bathrooms, we are sure your spruced up bathroom will be one of your favorite rooms in your house. There is nothing that says ‘spa’ more than a rolled up towel waiting for the customer. However, who rolls up towels in their own bathroom. By using a wine rack holder as a towel rack, you will never have your towels unfolded again. A rolled up towel is the same shape and similar size to a bottle of wine, therefore the perfect place to display your towels. These wine racks are affordable and easy to mount on any wall. Also, because the wine racks will be placed on a wall, it will not take up any new ground space. If you use this idea for your small bathroom, not only will it be a great storage solution for towels, it will also turn your mini bathroom into a mini spa. Not many people use the space above a door in any room. However, it is still a great place to use for decoration and storage. By mounting an attractive shelf over the door frame, you not only have a place to store things that are out of the way, but you can also place decorative items on it. We like the thought of some plants and flowers above the door frame. If there is no natural sunlight coming in, then a fake plant will be a good substitute. A simple idea but often they are the best. Adding woven baskets into your bathroom decor, not only gives a nice clean, country style feel to it but they are also great for decluttering. Trying to keep a small bathroom organized and tidy is not an easy task, therefore every little thing helps. A soft colored bathroom with woven baskets will also give a nice bright, light airy feel to a small space. A breath of fresh air to a small room. A common piece of advice for owners of small homes is to paint rooms with bright colors because bright colors open up the room, where as darker colors close up the room. This is the case with both painting and also tiling. 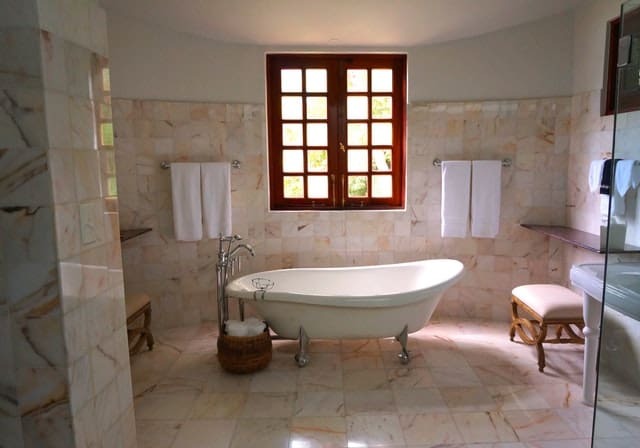 Bright colored tiles will make a small bathroom feel bigger and this is the case for tiles on walls and floors. A bright colored tile floor reflects light well and makes the room feel larger. If you would like to make the shower your focal point in the bathroom, why not create a window curtain effect with two shower curtains rather than one. The curtains can be closed or why not tie them back to give a more welcoming feel to the bathroom. 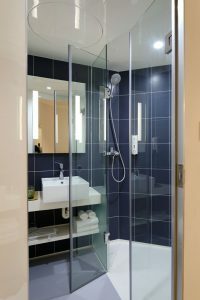 Depending on whether you have a stand in shower or a tub, having glass instead of shower curtains will allow more light to pass through the whole of the bathroom, making it feel more spacious and airy. To add a little more privacy to your shower time, you can get a frosted glass panel. A frosted glass panel will still allow light to pass through, therefore still gaining the benefits of a more spacious feel. A large mirror can be a wonderful focal point in a small bathroom. Large mirrors will make a small room look a lot bigger than it is by giving the illusion of more depth. A large mirror will also reflect light throughout the room, making it feel brighter, lighter and more spacious. A cabinet can be a basic square shaped box or a luxurious centrepiece for your bathroom. A bathroom cabinet does not necessarily need to be placed above your sink either. Specially designed cabinets that stand over your toilet can look great in a cramped bathroom and provide extra storage space. Another specially designed cabinet with full length mirror can be connected to the back of a door. If you would like to see these and many other types of bathroom cabinets for small bathrooms, then follow the link. Just because a bathroom is small, doesn’t mean you can’t add a little luxury to it. There are plenty of small sinks that have a designer feel and will add 5 stars to a small bathroom. Some sinks have a cabinet connected underneath, which not only looks great but also adds some extra storage space. The same thing can be said for bath tubs. 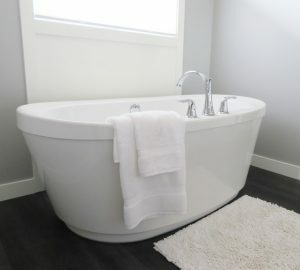 Stylish bathtubs come in all shapes and sizes and many owners of small bathrooms have found a spot in the corner for a soak in a small bathtub. Why not add a little rustic feel to your small bathroom by adding some wood as decorative pieces. There are many places you can add some natural wood to your bathroom, for example adding wooden storage shelves to the walls. A wooden bench across your bath will look a lot better than a plastic version. A wooden shower chair or even a shower mat made of wood can add a spa like feel to your bathroom. A small bathroom doesn’t need to be a boring bathroom. A small bathroom can be just as stylish as a larger one. By adopting a few of these decorating ideas for small bathrooms, we hope you will be able to not only add some style to your bathroom but also make it more spacious and comfortable.